With a new year comes an opportunity to share more Green Recovery narratives. This is the first story I’m posting for 2016, and it offers a unique perspective, one that few of these testimonials have shared so far. Earlier this fall, a reader emailed me to say that she both appreciated the Green Recovery series and also found it to be triggering. One of her concerns was many of the stories implied that one can eat whatever one wants on a vegan diet, that the need to count, measure, or weigh disappears because the foods consumed are healthy, nourishing, and so on. I agree that this message–the idea that you can eat whatever you want and as much as you want when you go vegan–is problematic. One can’t truly eat endlessly on any sort of diet (veganism included), and to imply as much may trigger binge eating or distort one’s sense of dietary balance. I do think that most vegans can eat a bit more volume than most omnivores, because the absence of animal fats usually creates a slightly less calorie-dense eating paradigm overall. But it’s not always the case, and it’s also not something that should be taken to extremes. 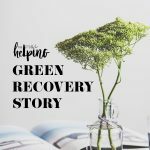 My reader’s email got me thinking about some comments and emails I’ve gotten over the years saying that Green Recovery stories can be both inspiring and also frustrating to read for those who are still in the grips of an ED. This feedback has made me intent on sharing more posts that highlight the complications and difficulties and impasses of recovery, as well as the breakthroughs. As I’ve said in the past, I don’t believe that veganism is a “solution” to disordered eating, and the intention of Green Recovery isn’t to suggest as much. Rather, it’s to open up a dialog about the possibility of veganism offering a meaningful perspective to those who have struggled with EDs. For me, veganism was a turning point. It placed food my choices in a philosophical framework that allowed me to break free from some of the obsessions and fears. But I’d be nowhere without the work I did in therapy, as well as extensive self-reflection and honest dialog with family and friends. In other words, veganism influenced my recovery, but it didn’t create it. And I think it’s important to share narratives that make clear that veganism is not therapeutic for everyone. Today’s story does just that, and it’s also an inspiring example of self-reflection in action. Because she’s the person who opened up this important dialog, here is Alisa’s story. My “recovery” from disordered eating did not begin with adopting a vegan diet and lifestyle. In fact, as of today, I have not recovered from disordered eating despite having been vegan for five years, meat free since 2006. While it is true that my diet now is more heavily focused on plant-based meals than in the past, and that I eat more nutrient-dense meals now than I did even just a few years ago, I am still in the clutches of my eating disorder, alternating between periods of bingeing and purging and restriction. Veganism did not “liberate” me from my eating disorder; instead, it merely gave me license to continue to binge and purge and restrict, even as the food groups on which I binged remained the same. In this way, my green recovery story is not a story of how veganism aided in my recovery from an eating disorder but rather a story about how I developed disordered eating, transitioning first to vegetarianism and later veganism, and maintained my disordered eating despite adopting a healthier diet and lifestyle. Like many people who have contributed to this series, I come from a family preoccupied with food. My father’s family is from Italy, and my parents are both from the working-class. Visits to my paternal grandparents’ home were met with food: wandering through my grandfather’s garden and delighting in the abundance of zucchini planted with me in mind, eating pastina when sick, modeling my preference for warm polenta with milk after my grandfather’s. To say that food occupied space in my grandparents’ lives would be an understatement; for my grandparents, food was everything – from the garden planted each year that fed my father, his siblings, and, later, their children to the homemade peanut butter crackers that adorned the dining room table regardless of if visitors came or not. Food carried weight with my grandparents, both for what it meant culturally and because, at times, food had been scarce, and the ability to feed a family of six was a source of pride for my grandparents. As I began my transition to veganism, my grandmother confronted me with questions about what I would now eat; in reality, her questions were also about why I had rejected my cultural heritage, as food played a prominent role. To my grandmother, being vegan meant a move away from the family – a point of soreness that has been compounded by the other ways I’ve differentiated myself from my working-class home and past. I went vegetarian in 2006, the same year I moved from my hometown to pursue a PhD in English. My transition to vegetarianism, then, coincided with a transition away from what was familiar – my home, my hometown, and faculty who had been largely supportive of my academic career. In truth, my transition to vegetarianism was unguided, not borne out of ethical concern for the well-being of animals but rather influenced by dating someone vegetarian and enjoying the meals she made. It is at this time, as well, that “restriction” meant only slowly eliminating foods I once enjoyed, foods that had been important to my family and attached to memories of my grandparents. In 2006, despite being moderately overweight (my father referred to me as a “chunky Italian girl”), my only preoccupation with food was that I would no longer enjoy these foods of my adolescence. In 2006 I also began seeing a therapist, but not for the reasons for which I now see her. At our first meeting, I told my therapist that despite feeling some sadness at eliminating meat and seafood and wanting to lose a few pounds, I didn’t have an issue with food or my size/shape. In other words, I didn’t have either disordered eating or body dysmorphia prior to or at the time of my transition to vegetarianism – a narrative in contrast to many in this series. It wasn’t until 2007, a year after making the switch to a plant-based diet, that I developed disordered eating, and it was brought on by a confluence of factors. The university from where I received my PhD (trigger warning here) has one of the highest, national rates of eating disorders among all colleges in the U.S. – so high that the counseling center has a team of researchers to figure out why, and many dorm bathrooms are locked after a certain time to discourage purging. I spent five years teaching at this university, watching female students in their first semester begin to carve themselves into smaller and smaller frames until by their junior or senior years they were skeletal. I dealt with a student body that valued thinness for women all costs, often imposing on female students unrealistic expectations and reinforcing for many that to find their “merger” (when two graduates marry) they must be thin. The epidemic that plagued undergraduates spread to graduate students, some in my own department. Reflecting on the etiology of my eating disorder, I now understand that these factors – teaching students with disordered eating, watching graduate students mimic these unhealthy behaviors – contributed to what was becoming an unhealthy relationship with both food and my body. Of course, contributing to this relationship, as well, was my inability to cope with new stressors in my life (being away from what was familiar, including my best friend and partner, and dealing with unsupportive faculty). I also believe that the root of my eating disorder is genetic, inherited from a father who vacillated between extremes in weight and attitudes toward exercise. Throughout the course of my graduate program, I did not recognize my relationship with food as an eating disorder, simply that I would binge eat, feel shameful and angry, resolve not to binge but do it anyway. As I have many times in my life, I spent much of my PhD program eating away my feelings – using food as a way to control what felt very out of control in my life, e.g. stability of job market, etc. In the last year of my program, I routinely binged. The more stress I experienced, the more calories I consumed, often when my partner was not home or out of town. I did not weigh myself once in 2011, but I knew that I had put on considerable weight, and that I felt increasingly uncomfortable as a result. I graduated in 2011, accepted a job in nonprofit, and continued to binge. It is also in this year that I transitioned away from vegetarianism to veganism, although my diet still largely consisted of vegan convenience foods, the cheese pizza traded for the Daiya pizza and ice cream traded for the vegan variety. As is true today, veganism meant for me in 2011 an ethical decision, a conscious move away from the dairy industry and its mistreatment of cows and goats. It was not redemptive in the sense that it alleviated my disordered eating – only that it meant less animal suffering. Flash forward to 2013 – still vegan and still overweight. In 2013, I decided to “get real” about my health and actively made strides to eat better and lose weight, which I did almost effortlessly; the closer I came to my weight loss goal, however, the more I restricted. I had traded binge eating for anorexia and suffered new health conditions as a result. After having gone four months without a period, I contacted my gynecologist, only to be told that perhaps I should start birth control to jump start my period. I did but have since stopped taking the medication. Sadly, not menstruating was not enough of a scare for me to gain weight or change my habits. I came to like the body I had developed, the aesthetic I had created, the way my body looked as I ran (am a marathon runner). My new attitude towards food and my body now took up too much space in my therapy sessions, and I became frustrated with my therapist (still the same one as in 2006) who told me that I would need to gain weight to have a period. Eventually, my period resumed but left again once I resumed marathon training, even while on birth control. I began to eat more broadly and permissively, even while on a vegan diet, and I tried eating more during the day. I gained a few pounds but also gained back bingeing – brought on, likely, from such periods of restriction. Unlike in my graduate program, now I binged and ran off the calories or restricted, weighing myself daily. I developed an almost obsession with “clean eating” (orthorexia), and I had anxiety eating out or eating food others had prepared. I frequently found myself either trying to avoid food entirely or objectively bingeing, even at other people’s houses. I became embarrassed by my behavior and have been desperate to stop it, to reestablish a healthy relationship with food and my body. Throughout this process – my move from understanding food as fuel to food as something to be counted and both feared and obsessed over – I have taken small steps to get back to the center, to establish moderation, to not vacillate between extremes. One way that I’ve done this is by talking with friends who have recovered from eating disorders, to practice (although I am not generally very successful) the strategies given to me by my therapist, and, lastly, to be open about having an eating disorder. This narrative, this history of my transition to both disordered eating and veganism, has been both cathartic and anxiety provoking, both liberating and restrictive, both helpful and harmful. I am glad to tell the truth about my eating disorder, but in writing my “recovery in progress” (because, again, I have not yet recovered) I am reminded of how far I am from recovery. I’m really grateful to Alisa for sharing her experience today on the blog. I hope others will agree that it lends an important new dimension to this conversation, and I hope that future stories will continue to collectively represent a wide range of experience. Beyond this, I find Alisa’s writing to be bracingly honest and very thoughtful. I could (as is usually the case when I read a green recovery narrative) relate to much of what she described, especially some of the tensions she felt within her family. As always, I would love to hear your thoughts and responses to Alisa’s story. And, for those who have experienced veganism or vegetarianism after an ED, I welcome thoughts and impressions on how the diet may have influenced recovery–beneficially, detrimentally, or not at all. 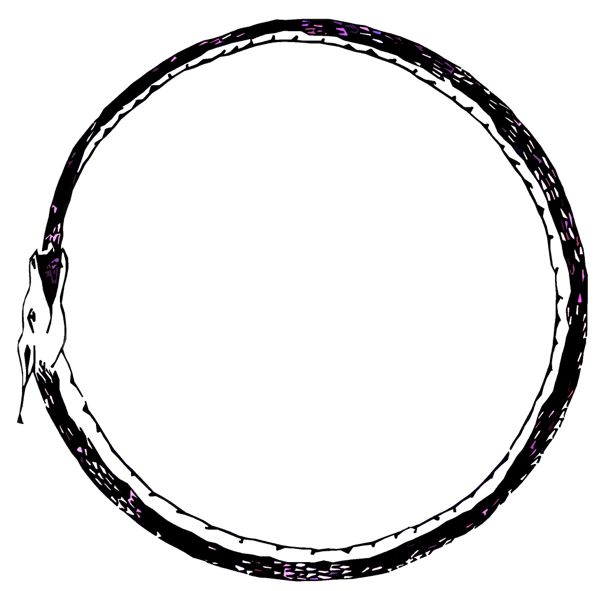 By the way, the ouroboros image today was Alisa’s suggestion. When I asked her what sort of image might be appropriate for her post, she said she’d like something that “demonstrates a self forever in transition.” I can’t think of a better way to capture the recovery process as a whole. I wish you a great weekend, and I look forward to weekend reading on Sunday. A massive ME TOO! Although my ED has taken a very different narrative to Alisa’s (pretty much textbook anorexia) I went pescatarian because I stopped liking the taste of animal meats at least a year before the onset of illness and make the transition to veganism in the midst of it.. Because of the timing my veganism has been repeatedly derided by clinicians and i have found myself having to defend my ability to have BOTH a personality and ethical beliefs AND an eating disorder concurrently; ED sufferers are often very logical, rational and analytical in every (other) area of life. My story is complicated because I did initially go vegan for restriction but later embraced the ethics. Anyway, long ramble but I loved hearing Alisa’s experience and viewpoint and I’m so glad to hear she got some catharsis writing. Thank you for sharing this post. It’s an important message to share. Eating disorders know no bounds when it comes to diet … great post! I really enjoyed this. I didn’t fully recover from my eating disorder for many years after going vegan. I’ve read each of the stories in these series, and I have seen little pieces of myself in each one. Yet I still struggle to understand if there is any relationship at all between my diet and my recovery. It’s so difficult to tease out all of the complex factors, but I do like that this series is highlighting the many different pathways, even when recovery is still very much taking place. Anyway I wanted to thank you Gena, your blog is a shelter, an inspiration and so much more. I’m sorry for my poor english as it is not my mother tongue. Great post! Unfortunately, I feel that a lot of media & hence the general public, tend to generalize about veganism & orthorexia as being one & the same. Beautiful post Alisa, I bet this was very difficult to write. And Gena, thank you for sharing and offering this perspective! I *loved* this different kind of Green Recovery story. it is SO important to show the many ways that veganism and EDs can intertwine and not intertwine, and I am super happy that this can be a platform for different experiences. I was already vegan when my ED came about, and for most of my recovery I remained vegan through much trial and error. I got better as a vegan, I relapsed as a vegan, and I got to where I am now as a vegan (which is to say, solidly in recovery and feeling good about food and body, but never would I use the word “recovered”, because I know ED thoughts can hang out in the wings and pop up during times of vulnerability.) Veganism and recovery CAN be connected, but really that’s not the FUNCTION of veganism, as Alisa points out. ANYWAY. I am super feelin’ this one and so appreciate the share. i love that Alisa brought this up. After eating more plant based, I too began eating more, but I/my body didn’t handle it well, and I always am so interested… and confused.. when I hear how people eat in such abundance. I love the introduction to her post as well, Gena. beautifully written and spoken as always! Excellent work guys. Yes. The topic needs more room from people who were omnivore without an ED and shifting to veganism mainly for ethical (animal) reasons and getting caught up in thinking about food choices a bunch more than they had, and the whole healthy vegan thing, and ending up with some kind of orthorexia!